By Ihab Akladious, M.D., Refky Nicola, D.O. 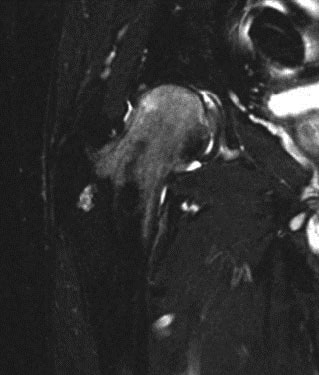 A 57-year-old man presented with right hip pain which had begun a few months prior and was thought to be related to his work as a truck driver. He denied any history of recent trauma or mechanical symptoms, such as clicking, locking, instability, giving way, or buckling. There is no significant medical or surgical history. Imaging work-up included initial radiographs, followed by MRI (Fig. 1). Acute onset of hip pain in an adult has a relatively broad differential. Serious and potentially treatable processes, such as hip fractures, osteonecrosis, and a septic joint must be considered and appropriately worked-up or excluded. Less common and often self-limiting processes, such as regional migratory or transient osteoporosis of the hip, are potential considerations, especially in the setting of localized and transient bony demineralization or marrow edema pattern on MRI. An occult fracture of the hip is an essential differential diagnosis to consider in the setting of acute hip pain. A non-displaced fracture can be occult on plain radiographs. On MRI, T1-weighted sequences will show hypointense fracture lines; fluid-sensitive sequences will show associated marrow edema. In the setting of a stress changes/ fracture, an incomplete hypointensity at medial cortex may be seen. TOH is a rare skeletal disorder that usually affects healthy middle-aged men and women during the third trimester of pregnancy or immediate postpartum period.5,6 The condition affects men twice as often as pregnant or postpartum women.7 TOH presents spontaneously with sudden-onset of pain at the affected joint. Pain is worse with weight bearing and may be disabling. Symptoms gradually subside within 4 to 9 months and may recur.3 Although many studies have tried to determine the etiology for TOH, the exact cause remains unknown. Magnetic resonance imaging has become the modality of choice for early diagnosis of TOH, with the typical changes seen within the first 48 hours after the onset of symptoms.3 MR imaging shows diffuse, ill-defined edema (decreased signal on T1 and increased signal on fat-suppressed T2- weighted images) without focal subchondral or articular surface defects. 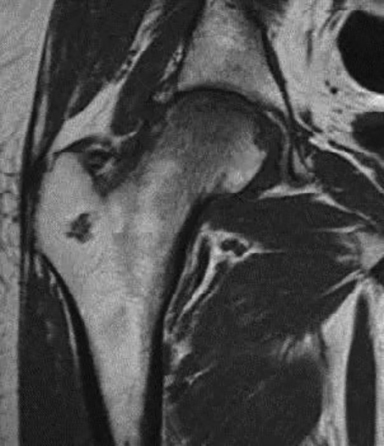 Edema extends from the articular surface of the femoral head to the femoral neck, can involve the intertrochanteric region and the acetabulum, and may spare the subchondral region of the femoral head.10 Fat- suppressed contrast enhanced images show abnormal enhancement with a similar distribution. A joint effusion may be present. Transient osteoporosis of the hip (TOH) is a benign self-limiting condition that can be differentiated from other etiologies of a painful hip (hip fracture, osteonecrosis, septic joint, etc.) on the basis of radiologic and clinical findings. Radiographic evidence of focal demineralization is the single most important finding and may become evident within 4 to 8 weeks of symptom onset. MRI often shows characteristic changes within 48 hours of initial symptom presentation and helps exclude other etiologies of bone marrow edema. The treatment of TOH is typically supportive with resolution within several weeks to months. Korompilias AV, Karantanas AH, Lykissas MG, et al. Transient osteoporosis. J Am Acad Orthop Surg 2008;16:480-489. Cahir J, Toms P. Regional migratory osteoporosis. Eur J of Radiol 2008;67(1):2-10. Curtiss PH Jr, Kincaid WE. Transitory demineralization of the hip in pregnancy: a report of three cases. J Bone Joint Surg Am 1959; 41:1327-1333. Rosen RA. 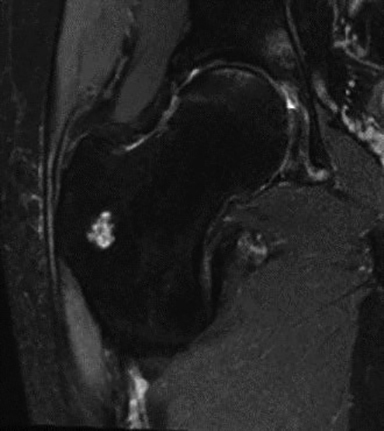 Transitory demineralization of the femoral head. Radiology 1970; 94(3):509-12. George M, Jordan M, et al. Transient osteoporosis of pregnancy. Injury, Int. J. Care Injured. 2012; 43:1237-1241. Hayes CW, Conway WF, Daniel WW. MR imaging of bone marrow edema pattern: transient osteoporosis, transient bone marrow edema syndrome, or osteonecrosis. Radiographics 1993; 13:1001-1011. Gaucher A, Colomb JN, Naoun A, et al. The diagnostic value of 99m Tc-diphosphonate bone imaging in transient osteoporosis of the hip. J Rheumatol 1979; 6(5):574-583. Malizos KN, Zibis AH, Dailiana Z, et al. 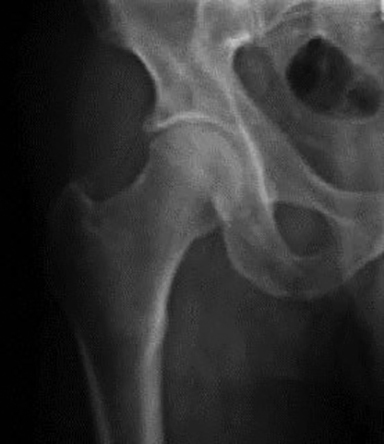 MR imaging findings in transient osteoporosis of the hip.Eur J of Radiol 2004; 50:238- 244. Akladious I, Nicola R . Acute Hip Pain. J Am Osteopath Coll Radiol. 2014;3(4):29-32. Ihab Akladious, M.D., Refky Nicola, D.O. Dr. Akladious works with the Department of Radiology, Rochester General Hospital and Dr. Nicola works with the Department of Imaging Sciences, University of Rochester both in Rochester, NY.